This website provides a pictorial study of the Holy Sacrifice of the Mass (Pius V Missal). 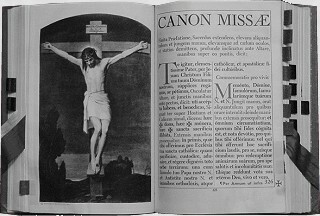 It contains more than seventy classic black and white photos with text, which are organized to help the Catholic Faithful better understand the various actions of the priest, God's representative at the altar. 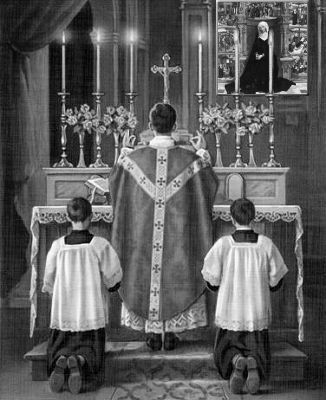 It intends to help them to use the Missal more intelligently and to appreciate more fully the actions of the priest and the sacredness of the Divine Sacrifice. The Mass consists of three important and necessary parts, the Offertory, Consecration and Communion. A Catholic is obliged to *attend Holy Mass each Sunday and Holyday of Obligation. To fulfill this obligation he must be present during the parts of the Mass named above. 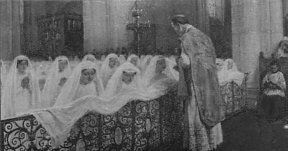 The word "Mass" is from the Latin "missa", or missio, meaning "dismissal", from the fact that its two parts, that for the Catechumens (converts under instruction of the Faith in order to be baptized) and that for the faithful, were formerly terminated with a striking ceremony of dismissal. The sending away of the people at the end of the sacred function survives in the "Ite, missa est," i.e. "Go, the Mass is ended." The Holy Sacrifice of the Mass is the unbloody sacrifice of the Body and Blood of Christ. It is substantially the same as the bloody sacrifice of the cross, and was instituted by Our Lord Jesus Christ at the Last Supper on the first Holy Thursday evening, just as He was entering upon His Passion. Then it was that He changed bread and wine into His most holy Body and Blood, and offered them in sacrifice, giving at the same time to His Apostles and their successors the power and the command to continue this sacred action in commemoration of Him to the end of time. "Furthermore, by these presents [this law] and by virtue of Our Apostolic authority, We give and grant in perpetuity that for the singing or reading of [the Pius V Missal] Mass in any church whatsoever this Missal may be followed absolutely, without any scruple of conscience or fear of incurring any penalty, judgment or censure." - Pope St. Pius V, Quo Primum, July 14, 1570. If you are looking to attend an approbated Tridentine Latin Mass (Pius V Missal) and/or receive the Traditional Sacraments in your area of the U.S or abroad, please contact the webmaster, at this email info@StGemma.com for Mass times and/or more information. 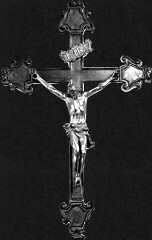 Note: This website TheHolyMass.com is dedicated to Our Lady of the Most Blessed Sacrament. It was launched on The Feast of the Ascension of Our Lord, Thursday May 5th, 2005 A.D., incidently which was also the feast day of Pope St. Pius V, Champion of the Roman Rite Tridentine Holy Mass.